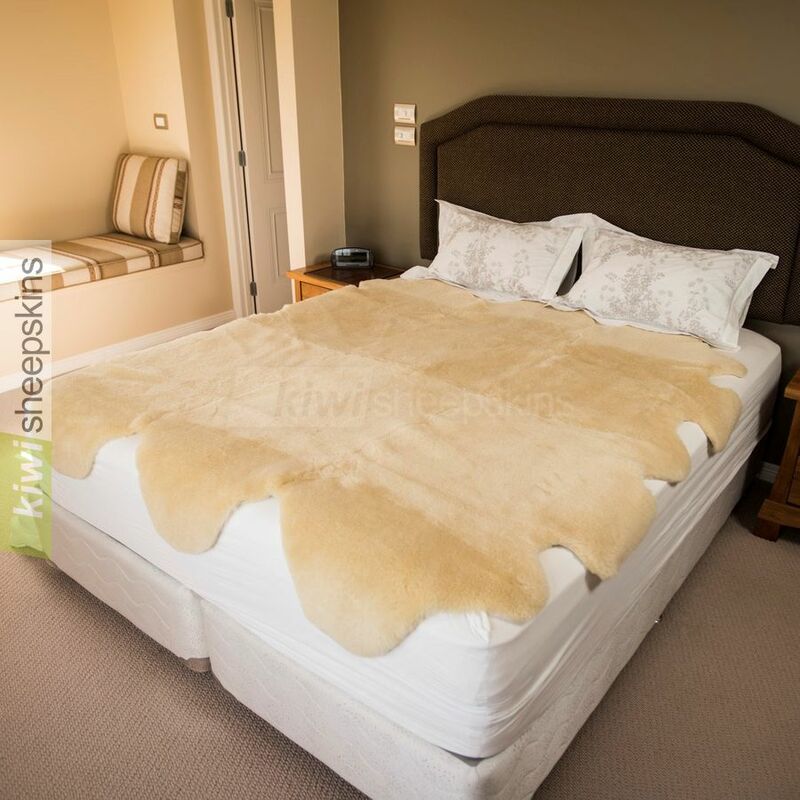 Enjoy the soothing properties of genuine medical sheepskins with these bed underlays which are simply whole shorn wool sheepskin pelts sewn together with no backing. Medical sheepskin bed pelts - made from the same genuine medical sheepskins as our premium mattress cover product. These multi-pelt bed pads are natural pelt shaped instead of rectangle and are pure sheepskin with no backing or elastic straps. A quality product tanned for us in Napier, New Zealand. Machine washable, care instructions attached to the medical skin. Medical bed pelts help prevent discomfort caused by pressure points or bed sores that occur during long periods of immobility such as lying in bed or seated in a wheelchair. The springiness of the shorn wool pile distributes pressure evenly over the body, allowing air circulation and the non-build up of moisture. This results in coolness in summer and warmth in winter. The Single bed (double pelt) sheepskin is also great as an exercise mat and popular with the Kundalini yoga community! Available in 4 sizes Smallest size (Single bed) is kept in stock, all other are special order items. 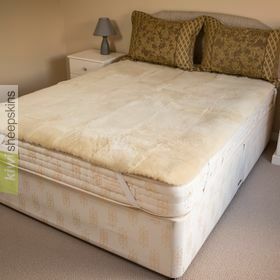 For the ultimate in sheepskin bedding luxury, see our rectangle medical sheepskin mattress cover to cover the whole bed. Customer reviews/feedback for our natural shape medical sheepskin pelts. This is the third purchase I have made in the last month or so....my son also ordered when he saw how fabulous your products are. I just had to let you know how impressed I am.... with the products, the very reasonable prices, the ease of ordering and shipping....about a week from you to the US, my island, Martha's Vineyard...your website information....every detail perfect! 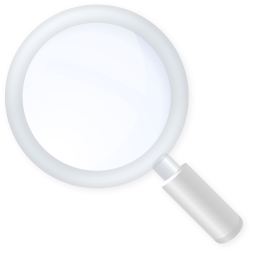 I have been raving about you to everyone so hope "the word of mouth" priceless advertising leads to more sales..... Just a wonderful company, rare these days and worthy of praise. Thank you so much! Hi, it is me, back again after "test-sleeping" on the Natural Shape Medical Sheepskin Underlay for almost 3 months now... And I only have one regret: that I didn't order this item years ago !! Over the past couple of years, I have purchased from your company the following: 2 car seat cover sheepskins (separate transactions a few months apart), one padded medical sheepskin seat pad, 1 pair of sheepskin medical padded wheelchair arm covers (wide), and, the latest purchase 3 months ago, was for the natural shape medical sheepskin underlay. Thank you so much, for your warm, empathetic service, as well as your superb-quality products !! Bravo, and best wishes to you, your family and your Company !! Many thanks, the parcel was delivered today. I am thrilled with the quad underlay. Once again, a beautiful product !!! I just received my order and had to send my first "fan letter" ever in a long life to your company. The twin size sheepskin is absolutely beautiful and the delivery time from half a world away took one week ! And this is during the holiday rush ! It takes longer than that to receive some of my orders from neighboring states. Thanks again and I am happy to join the ranks of your satisfied customers. 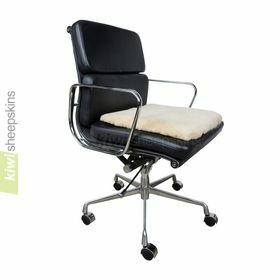 I ordered a single bed sheepskin and wheelchair sheepskin from you on Sunday night and am writing to say how thrilled I am with your product and service. It arrived here in Australia in four days. Thank you so much!